Tower Hamlets has the fastest growing population in the country and is home to one of the country’s most diverse communities. The borough has always been a home to migrant communities beginning with the French Huguenots in the 16th Century, followed later by Jewish and Irish migrants. Bangladeshi residents began arriving in the borough during the 1970s. Somalian residents arrived as seamen and then later as a result of war in Somalia. Tower Hamlets has a population of 284,000, and over the last decade the population has increased by 34.5 per cent, the largest increase of all the local authorities in England and Wales. Around 32 per cent of the borough’s population increase has been due to ‘natural growth’ and the remaining 68 per cent a result of migration. More than 43 per cent of the borough’s residents were born outside the UK. This is the 9th highest percentage nationally (of 348 local authority areas). The migrant population is hugely diverse and includes older residents who migrated to London decades ago, alongside more recent arrivals. Some 28 per cent of the migrant population are long established residents who arrived in the UK before 1991; 18 per cent arrived between 1991 and 2000, and over half (54 per cent) arrived between 2001 and 2011. The majority migrated to the UK as young adults and children. The Census identified that Tower Hamlets residents were born in over 200 countries. First generation Bangladeshi residents make up nearly half of the borough’s ‘ethnically’ Bangladeshi population. There are a further 20 migrant groups with significant populations of more than 1,000 and these include India, China, Italy, France, Somalia, Ireland, Poland, Australia, Germany, the US and Spain. Tower Hamlets has the highest percentage of Muslim residents in England – 35 per cent compared with the national average of 5 per cent, and the lowest proportion of Christian residents, 27 per cent compared with the national average of 59 per cent. 74 per cent of the borough’s population are aged 16-64, 8th highest in London. The average age of residents is 31. There is a large disparity in wealth between the borough’s richest and poorest residents. It has the highest rate of child poverty in the country and yet the average salary of those who work in the borough is £58,000, the second highest in the country after the City of London. Data from DCLG Indices of Deprivation 2015 revealed one quarter (25 per cent) of the Tower Hamlets population live in income deprivation – the 6th highest rate of all English local authority areas, and the highest in London; however it has an economy worth more than £6 billion a year. The construction of new developments across the borough, especially around Canary Wharf, is compounding the wealth divide as more affluent communities are moving in. Tower Hamlets sees social integration as part of community cohesion. The Tower Hamlets Community Plan 2015 outlines the vision for the borough where people, regardless of their backgrounds, have the opportunity to achieve their full potential. The Strategic Plan 17/18, sets out the council’s aim to create more engaged, resilient and cohesive communities. One of the four key themes of the Tower Hamlets Community Plan, as part of its priority outcome to create and maintain a vibrant successful place, is to create a Safe and Cohesive Community and, as part of this, the plan highlights a commitment to promote community cohesion. A cohesive community enables all to have an equal stake and status in the community; where people have the same opportunities as their neighbours; and where people have a commitment and responsibility to contribute to the well-being of their communities. 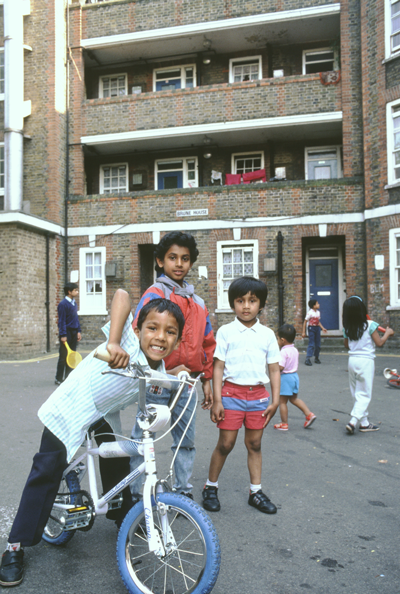 Tower Hamlets is a highly diverse borough and its demography enables people of different backgrounds to understand one another and build positive relations. This is evidenced by the fact that, according to the borough’s 2017 Annual Residents Survey, 92 per cent of its residents agree that people from different backgrounds get on well together; this is up five points from the year before (87 per cent) and a new historical high. Engage and promote greater involvement of local community groups, withh residents taking ownership in response to local issues. Bring people of different backgrounds together to celebrate local identities and culture and develop strong and positive relationships through positive interactions. Ensure the sustainability of projects through developing new and emerging community leaders. Increase the sense of citizenship, and local identity based on common values, history and culture. In addition, the council funded projects which specifically promote the understanding and coming together of different faiths and beliefs. The latest Census results show that around two-thirds of the borough’s residents ascribe to a faith or religion, therefore the Council recognises that this is one good way to strengthen community cohesion. Support and development of the Inter Faith Forum. Development and co-ordination of ‘Local Voices’, a forum for disabled people. Development and co-ordination of an LGBT Community Forum. Development and co-ordination of the New Residents and Refugees Forum. Tower Hamlets Council has commissioned Praxis, a local organisation which specialises in working with newly arrived and longer-settled migrants to deliver a New Residents and Refugee Forum for the borough’s migrant residents. As part of this service, the provider engages with migrants by holding a user group meeting on a specific theme, such as access to health services or hate crimes immediately after the EU Rerefendum, to identify needs or gaps in service and discuss ways in which this could be addressed. The provider uses this information to produce a briefing for stakeholders and hosts a meeting for relevant statutory and community service providers to come together and agree to address the issues identified by the migrants. Clear actions are identified and these issues are developed into an action plan which is delivered through the forum. Two thirds of the group felt less safe or comfortable than they had prior to the referendum. A number had experienced some levels of abuse, including people saying things such as; “your benefits are going to stop” and “you’ll be told to go”. People were very aware of press reports of serious racist incidents and this increased the sense of unease and insecurity. Hold a stall at Praxis offices during national hate crime week at one of their drop in sessions to promote local Hate Crime services and methods of reporting. A greater awareness amongst migrants of what constitutes a hate crime, the importance of reporting hate crimes and different methods in which they can be reported. A better understanding among migrants of the impact of the government’s Right to Rent scheme and their rights in relation to this. Greater confidence amongst migrants when interacting with Immigration Officers and knowing their rights. A strong and united voice for migrants who identify as lesbian, gay, bisexual or transsexual. Tower Hamlets Council deliveres the ‘Creative Communities’ project through its school library service, which aims to promote cohesion in schools and the wider community in Tower Hamlets. The project began in September 2016 and is working with seven student council groups based within schools in the borough; it is expected to conclude in summer 2017. Each school agreed on a community issue which impacts negatively on community cohesion, then identified and worked with relevant community groups and organisations to address the issues on a local level. Introduced teachers to several tools to measure attitudes around ‘community’ and help learners develop empathy when faced with diverse people and views. These were ‘take home’ activities for teachers to use in their first session with student councils. Introduced teachers to ‘Harts Ladder’ as a means to gauge student involvement in school projects. This model was used to encourage teachers to consider how to move children from a charity mind-set to a social justice mind-set. The provider emphasised that this was about developing community relationships rather than fund-raising for the community. It was important too that teachers were clear these were to be student-led projects, with teachers providing support. Developing student leadership and engagement was key to building sustainable community relationships. The council ran three training sessions for pupils and staff to facilitate cohesion projects. The main aim of the workshops was to create a space for pupils to raise issues and deliver presentations on cohesion to their peers in student councils. The council met with student council representatives and introduced them to a baseline audit which they later ran with their entire school council, back at school. It used a ‘problem tree’ and ‘solution tree’ model to start them thinking about community issues. Their teachers had prepared these on the Sustainable Development Goals’ materials. Peer feedback was carried out through a ‘wind-milling’ activity and this created a real buzz in the room. It was evident they enjoyed sharing their opinions on others’ ideas and listened thoughtfully to feedback. The Council also ran a competition to name the project, which generated some interesting entries. ‘Creative Communities – Every Child Cares’, was the winning entry. The second session in January focused on sharing good practice in community cohesion projects from across the globe. These videos showed young people as active ‘change-makers’ and emphasised the idea ‘Start small, think big.’ The Council was aware of the pressures on the school timetable and was keen to keep the work load to a minimum, but with maximum impact. It used SMART targets to encourage this thinking in project planning. Following Session 1, an online survey was sent to all participating schools, and distributed to parents, students, staff and governors. The purpose of the survey was to generate ideas for community cohesion projects. The results identified the community’s key concerns and indicated suggestions for how schools could promote cohesion in these areas. The survey enabled schools to create projects based on real time based issues, currently ‘hot’ in the local community, rather than only through the school council team. Planning forms designed by the council highlighted how each school planned to target the local issue, while building on pupils’ knowledge, skills and values as active citizens. These three areas were previously referred to in the teachers’ session. The final training session for schools was held in May 2017. The commitment, enthusiasm and level of organisation among the pupils, and the sense of ownership over it, were very impressive. For the session, each school designed a poster about their project and held a ‘Show and Tell’ where pupils presented their projects and gave their ‘Story so far….’ All presentations were filmed and snippets included in a short film shown at the celebration event in July. A filmmaker was employed to create a video of the children’s work. High resolution images and videos of each school’s project will be passed onto the filmmaker for a video that can be embedded on the council’s website as well as schools’ websites as a legacy of the project. A durable handbook will be produced by September 2017 and given to schools, as a resource for future school councils. delivering projects and considering long-term goals and sustainable partnerships from the outset. 2. A system of ongoing support for schools that need extra guidance. 3. A final event is planned for July 6th on the Golden Hinde. This event will be centred on acknowledging the work of the schools, recognising those projects that went the extra mile, and nominating a ‘Best Project’ initiative. Rather than having a competitive ‘Prize-giving’ system, the idea will be to commend exceptional work and hard-working individuals as ‘community heroes’. 4. ‘Train the Trainer ’ materials for School Councils in the form of a durable handbook which will be given to schools and used in all the training sessions. These guides will be left in schools as a resource for future school councils. Lesson plans for teachers, accompanied by guidance leaflets that invite teachers to do some adult level thinking around the concepts of cohesion and equalities. The deliverable lesson plans themselves include exercises around deeper-level thinking, influenced by Philosophy for Children approach and encouraging pupil voice. The council is working with the Tower Hamlets Cohesion Working Group, the strategic group of community and statutory stakeholders which oversees the delivery of cohesion activities in the borough, to develop a community cohesion strategy for the borough. Some initial work has been to undertaken to prepare the ground to develop the strategy; this includes an exercise with partners and community groups to map all community cohesion initiatives across the borough and a discussion on community cohesion priorities with partners. It is envisaged that the strategy will be ready for launch in spring 2018. The council will be mainstreaming community cohesion in services across the organisation. Some of this work has already begun. The Housing Strategy 2016-21 recognises that a key role of the council is to foster community spirit and strengthen community cohesion, as the profile of the borough in terms of race, age and income is changing. In April 2016, in recognition of the impact of new developments on cohesion, the Tower Hamlets Planning Contributions Overview Panel (PCOP) agreed to allocate Section 106 funding from two developments to fund the delivery of cohesion projects focusing on the Mile End and Aldgate East Master plan areas. Both projects are being commissioned using a co-production model and aim to increase participation in the local community, build local neighbourhood groups that bring people from different backgrounds together and hold events that increase cross-cultural understanding. The projects will be designed to support robust and sustainable outcomes, with continuing value. Tower Hamlets Council recognises that services are better delivered and are more ‘fit-for-purpose’ when stakeholders and services users are involved in the development and production of services. This is why it is piloting the co-production model of engagement with local stakeholders in commissioning community cohesion projects. The council worked with representatives of voluntary sector organisations, local people and other stakeholders to co-develop a Cohesion Outcomes Framework and Specification for community-based projects which will work towards achieving the agreed outcomes. This is a step away from having projects which have a focus on outputs and a step towards having projects which work to achieve an agreed outcome. To deliver a programme of services divided equally across the borough, it was decided to spilt the borough into four clusters of wards and two projects were allocated to each ward cluster. The projects will be commissioned in summer 2017 and will run from September 2017.